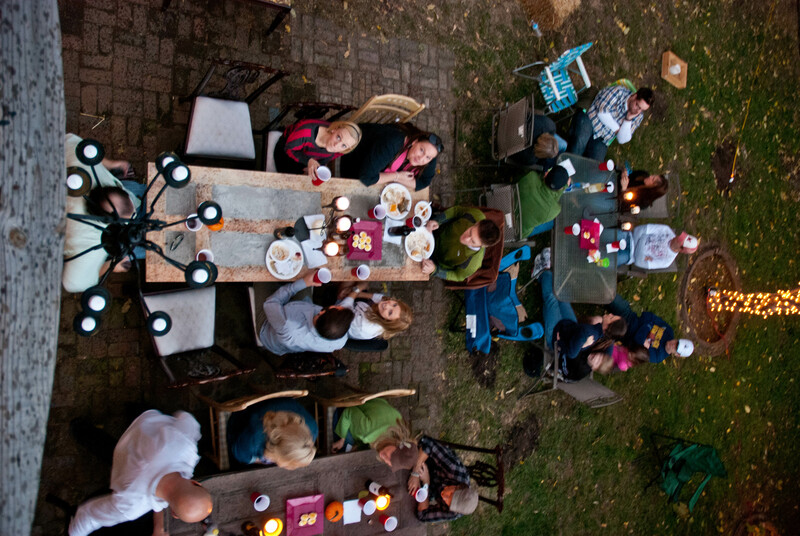 As we’re creeping up into winter, I’d like to return to the heart of Fall, to the 4th Annual Harvest Party. The Husband upgraded his door-tables this year by giving them a more modern twist. He also filled in the door dips with concrete…good concept, still working on the execution. . . His finished table does look lovely and perhaps will lead to his creation of a new dining room table for us. Eh dear? 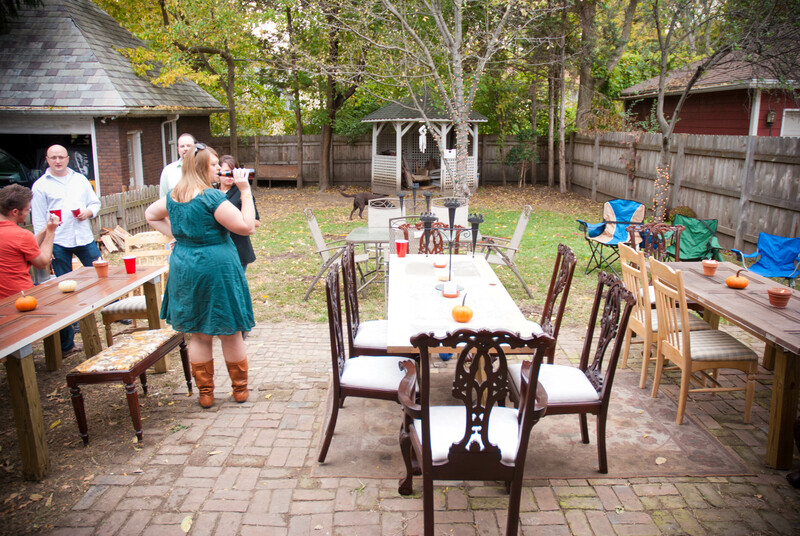 Since the number of guests increased to about fifty people, we needed to break out all of our tables, chairs and have the other hosts bring their assortment as well. We also incorporated a few bails of hay – added fall decor & useful seating. Candelabras, candles, mini-pumpkins and white lights strewn about created the enchanting atmosphere we were going for – oh, and we mustn’t forget the candelabra from last year. It glowed too. The meal itself, was, well, divine. S outdid himself with an enormous amount of pork. It was, without question, a feast. 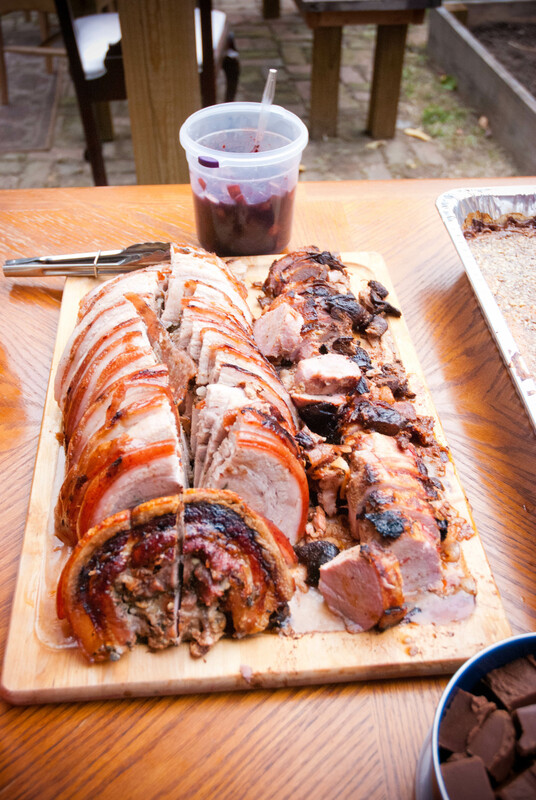 Flanked by two pork tenderloins wrapped in bacon, stuffed with figs, was a beautiful porchette with sage, garlic and rosemary. Not a sliver was left by the end of the night. 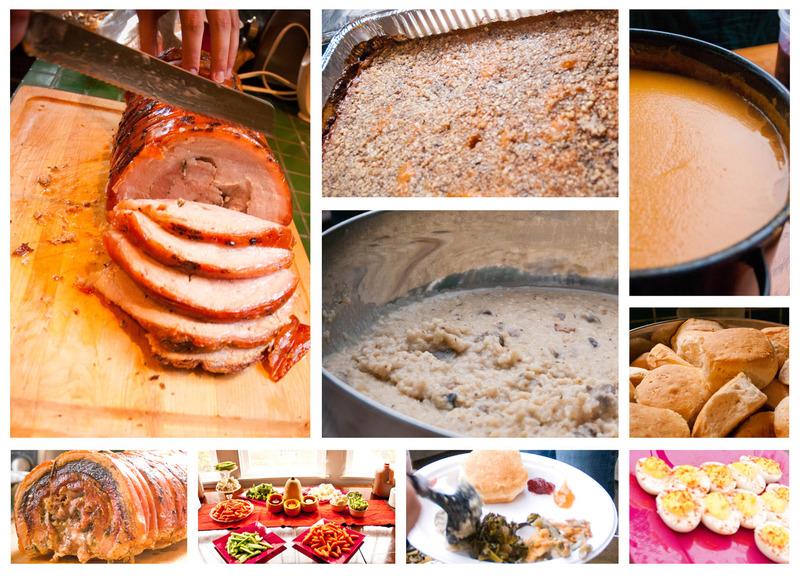 To compliment the main dish we had an array of sides, Pumpkin soup topped with blue cheese crumbles and bacon, sweet potato pudding, green bean casserole, apple-squash bake, wild mushroom risotto, collard greens cooked to perfection, deviled eggs, biscuits, jams, an amazing dessert thing drizzled in caramel and more caramel and to-die-for fudge. Finally, there was plenty of wine – thanks to that being an admission cost and the beer was, as I am told, amazing. Tim brewed a perfect beer for the night, a “quality ESB and premium bitter.” I meant to try it, but it was gone before I had the chance. It was that good. Thanks to all who attended our celebration of both fall and friendship and thanks to my fellow hosts that made the night delicious, joyful and the celebration it is intended to be. Here’s to friends, fall and food.